As I have stated in previous posts Pope Emeritus Benedict XVI was my first Pope as a convert to the Catholic Church. I came home to the Catholic Church almost five years ago and this fact remains one of the best and most exciting decisions I have ever made (my wife and children agree). In light of this statement, 2013 represented my first conclave as a Catholic and I think I watched (& read) all the coverage (literally). In light of my reading and research I was hoping for and expecting a different outcome from this election hence I was surprised when I heard that name Bergoglio from the balcony of St. Peter’s. What did not surprise was the next name that was uttered, Francesco. I believed all along that he would either take a name after P. Paul VI, P. JPII or P. BXVI (in honor of the New Evangelization) or he would choose an ancient name filled with deep meaning. Pope Francis did the latter when the first Jesuit to assume the See of Peter took the name of the humble and poor Saint from Assisi. Going back to my initial surprise, I did not know what to think when Pope Francis took to the world stage high above St. Peter’s Square and stood there, for what seemed to be an eternity, in stoic pose. Admittedly, I was hoping for the rock star personality of a Cardinal Dolan or the humble but quite young Cardinal Tagle – instead I saw a 76-year-old, seasoned veteran of the Church standing humble and quiet. I screamed, “Say something…” and watched on as the TV personalities wondered if he would actually speak or just proclaim the papal blessing. THEN HE TOOK US ALL BY SURPRISE. I knew we had something special when Pope Francis bowed and asked those assembled to pray for this new Shepherd of the Catholic Church. I was stunned and amazed that he was so self-aware, acknowledging his own need before millions. The faithful wanted him, his words and his blessing. Pope Francis wanted them, needed them and was truly in tune with the reality of the moment and the full weight of the Office of St. Peter. Pope Francis humbly bowed and asked for a blessing. Then, to my amazement, he blessed the faithful and seemed to linger in those simple white robes, dark cross and shoes for what felt like a very long time. All of us assembled began to get a glimpse of this new Pope, his style and what will be the cornerstone of this new pontificate – simplicity, humility, and poverty. 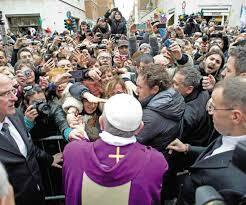 He is a living saint among the throngs who will lead the Catholic Church by example into the 21st century. That first evening Pope Francis rides the bus back with his brother Cardinals – shunning the Pope’s usual vehicle flanked by two security vehicles. After visiting Mary Major and greeting the faithful, Pope Francis returns to his pre-conclave lodge to grab his suitcase and pay his own bill. It is confirmed that the first Jesuit Pope takes the name Francis after St. Francis of Assisi – a Franciscan. 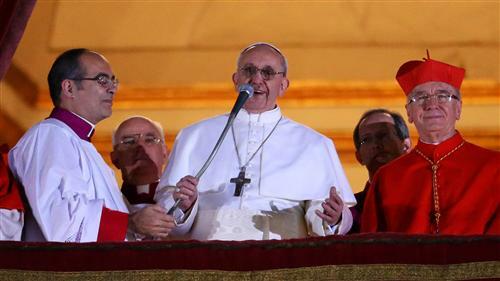 Rocco Palmo notes that Pope Francis isn’t even wearing the usual French cuffed shirts. So it seems that everything he does has a double meaning – symbolism at every turn revealing that strategy of a Francis’ pontificate. The stories of simplicity, humility and poverty with a personal touch is already winning over the world and made a deep impression on my heart. So, what can we expect next? Now this is the section where I get to speculate a bit based on what I have seen and read in addition to what I imagine will be. With John Paul II there was a presence that will never be recreated in future pontificates as far as the eye can actually see. He was a unique man at a unique time in history and made his mark on the Church, political life and on humankind in a substantial ways. In Pope Emeritus Benedict XVI we have the consummate German theologian in a simple / shy package who had the unique ability to carry forward what was begun under Paul VI, carried on by JPII and further developed within his own mind, through his writings and in his teachings. Benedict XVI was exactly what the Church needed over the last 8 years bringing us into the doorway of the New Evangelization. Now to Pope Francis – what can we assume or imagine about his pontificate? First, I believe we will be surprised. I believe he will be a surprisingly effective administrator and may be the first among future Popes to appoint a new generation of leaders among the Roman Curia instituting deep reforms (that will take years to be fully realized). Second, I believe we may get less in the way of writing (encyclicals / books) and more of a life lived in public – faith activated in ways that will take us off guard yet be a true and living example of Christ among us. Third, I believe that his popularity among the people of the world (who are mired in economic & political crisis) will stir a sea change among Catholics. Many will return to the faith and reposition themselves squarely in the midst of the Judeo-Christian ethic once again. This will not mean the end of secularism but will be a witness to it sparking conversation and dialogue among the world’s elite as to the meaning of this spiritual sea change and its implications. Fourth, countries with growing Catholic populations will continue their march towards prominence on the world stage and Pope Francis will help 1st world nations to deepen their respect for foreign and immigrant populations. Fifth, Pope Francis will endure the weight on continued scandal within the Church and vitriolic attacks from outside our ranks. Both will collude to derail real reform and the renaissance taking place within the Church. This will ultimately fail. Finally, the truth will continue to emerge both humbling the institution and benefiting the Universal Church under the leadership and wise judgement of this simple worker in the vineyard of our Lord. I would love to be a fly on the wall of the upcoming luncheon between Pope Emeritus Benedict XVI and Pope Francis. This will be a beautiful picture of the resiliency of the modern papacy and the smooth transition of the longest running global institution on the face of the earth. I will be watching with eager anticipation what becomes of the simple man from Argentina who now holds the See of St. Peter. Beautifully expressed, Eric. Pope Francis has filled many of us with hope. An ancient hope that leadership is both about inspiration and servanthood. That our greatest leader set an example by laying down his life, and all true leaders are invited to follow the same path perhaps not by shedding their blood yet shedding their own preferences for those they lead and of course serve. Francesco resonates just as it did in the thirteenth century when both the simplicity of the ascetic’s way of life attracted multitudes to a church that had often appeared distant from their experiences and aspirations, whilst also creating a new evangelisation that embraced both poor and rich, yet knit both polarities together in a single goal; to love both God and neighbour. The years ahead I sense will be years of refreshment and deep renewal in the lived out message of the church and in a simple and comprehensible articulation of the gospel of salvation for all. Pax et bonum! Love your thoughts – Micha.